The very first coffee grinder I ever owned was a super cheap electric blade grinder that cost me somewhere around $15 or so. I bought the thing somewhere around 2002 when I moved into my first apartment. I knew nothing about grinders at the time but I was buying whole bean coffee every now and then and this was all I could afford. Since then I’ve grown up a lot. I know a lot more about coffee and I know a lot more about grinders. And even though that first grinder still works I’ll never be using it on coffee beans again – it shreds them and does very little good to fresh whole coffee beans. Since I started drinking good coffee at home this year I’ve come to realize just how expensive coffee grinders can get. I don’t have that kind of money and even though I love coffee I’m still not a nut enough to buy one of those machines. Maybe I’ll do so if I get my hands on a proper dual boiler espresso machine but I don’t see that happening any time soon. In the mean time I’ve found that there are plenty of really good grinders that are still affordable. Brewing coffee at home is an art form in itself. While brewing coffee does not take rocket science, there are important elements that come into play in order to make a good cup of coffee. For coffee aficionados, they have perfected that art of coffee brewing that they can confidently tell the world how they can make better coffee than your favorite coffee shop. and get the water temperature and brew time right. For espresso, there’s another key element – pressure. When combined, these elements come together and give you that aromatic morning drink loved by more than 1 billion of people around the world. You can never enjoy coffee beans, unless its ground and extracted. To be able to this, you need to have a reliable coffee grinder to help you achieve your gourmet coffee dream. Most of the “good enough” grinders priced less that $50 tend to be manual but there are some decent electric grinders in this price range too. Below you’ll see my picks for best sub $50 coffee grinders. Other people’s opinions may differ but these are the one’s I’d tell my mother about. Made out of premium materials & outfitted with hidden grinding blades, the grinder machine safely grinds with impressive speed. Complete with a domed compartment that intercepts fine grinds, the no-mess coffee grinder is also unbelievably clean. Simply wipe it down with a damp cloth to keep it free of debris. Clear lid allows you to monitor the grinding process for a customizable grind. Stainless Steel Cup and Blade monitor the grinding process. Cup is removable for easy pouring. The outer layer of this coffee grinder is made of high quality PP material, and the inside layer is made of premium 304 stainless steel, it is highly durable and safe for daily use with a long life span motor. With a transparent lid, you can watch what’s going on inside this coffee grinder, providing you with a clear view and convenient for you to control the coarseness easily. Hope this helps in your quest to find an affordable coffee grinder. 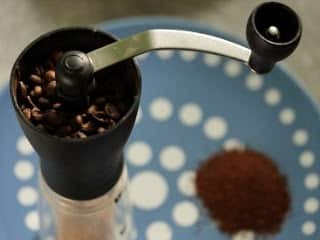 Here is an easy to follow buying guide if you want to invest on a coffee grinder. Able to adjust amount of ground coffee. You’ll need to be precise when you’re grinding for different cup-sized pots and single vs. double espressos. Size and capacity. You’ll want to be able to conveniently store your grinder and grind enough coffee in one batch to suit your needs. Evenness of grind. Evenly ground coffee gives more flavorful and consistent results with less bitterness and acidity. Clear grind settings. An easy way to adjust the grind from fine to coarse that works well and can be set consistently each time. Price. Make sure of a price tag that works with your budget and planned amount of use. Cleaning. How easy it is to clean out the grinder and whether it creates a mess on the counter. You may also want to see the following post if you are unsure whether to get a manual or electric grinder.